I have been just so excited to blog on this event and since Sunday was the official kickoff to bat season I thought no better time than the present. Plus, with school just getting out, this seemed like a unique thing to do to kickoff summer. Kayaking on what we now call Lady Bird Lake, plus watching the bats; does it get more Austin than that? These bat watching tours are lead by experienced guides that will take you to the Congress Bridge to watch the bats depart. I have been a bat watcher on several different occasions as it is one of my mom’s favorite things to do when she is in town. Kayakers beware, you may or may not have to dodge some bat droppings, but what a way to see them fly! Be sure not to forget your camera. 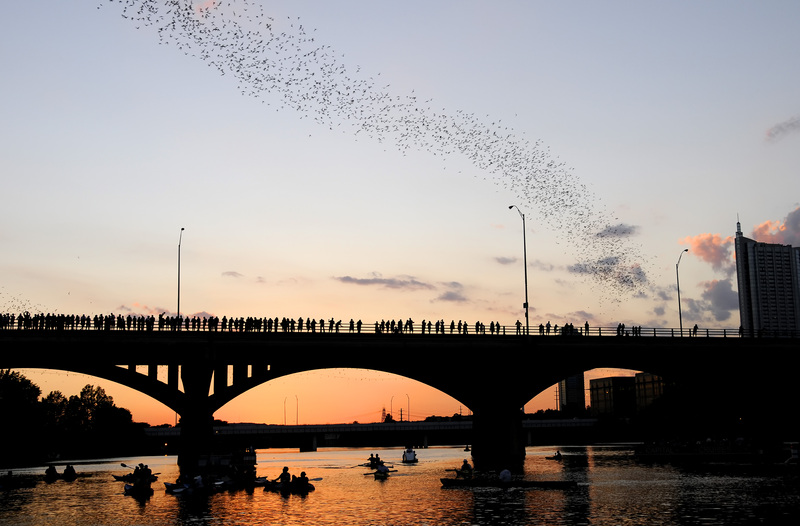 Seeing the Austin sunset at that time combined with the bats, is a true awe-inspiring moment. The tours start at 7:00pm and last about 2.5 hours, so definitely make an evening out of it. One last thing to mention is that I think it would be a great thing to do with out-of-towners. To all the bat lovers and Moms out there, this post goes out to you! • The bats provide a valuable service to the Austin community by consuming between 10,000 to 30,000 pounds of insects nightly! • Mother bats give birth to a single pup each year. The pups birth weight is nearly 1/3 that of its mother. • Bats are mammals and nurse the pups from mammary glands. Each female recognizes her pups voice and smell and will nurse only her pup. • During migrations to Mexico and back, bats may reach an altitude of 10,000 feet and velocities of 60 miles per hour. Fantastic Picture Today Thank You to Pete at Talke Photography! http://www.TalkePhotography.com/ Just a side note, I discovered his photos last night when I was looking for a picture to use today and he has some of the best shots of the city I have seen! Check them out if you are photography buff!